In addition to winning both Supersport 600 races and making his lead in the standings practically unassailable, West recorded the fastest ever lap around the tricky 3.7km track, while 14-year-old Hall became the first Australian ever to finish on the Underbone podium in the 22-year history of the series. 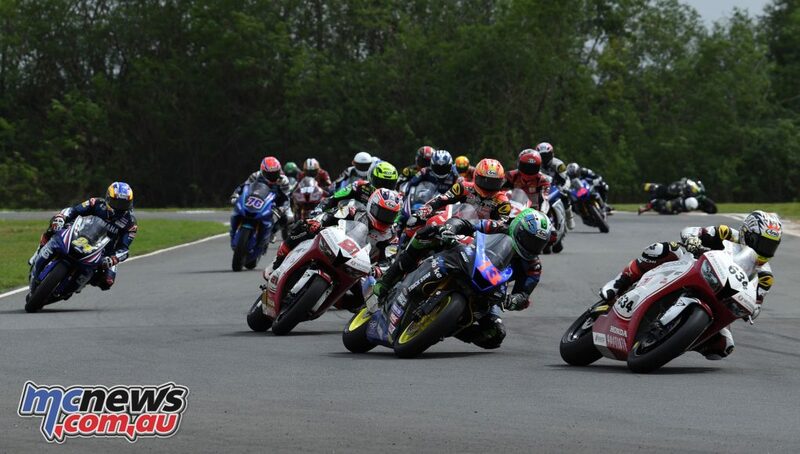 The next round will be at Sentul Circuit in Indonesia on October 12-14. 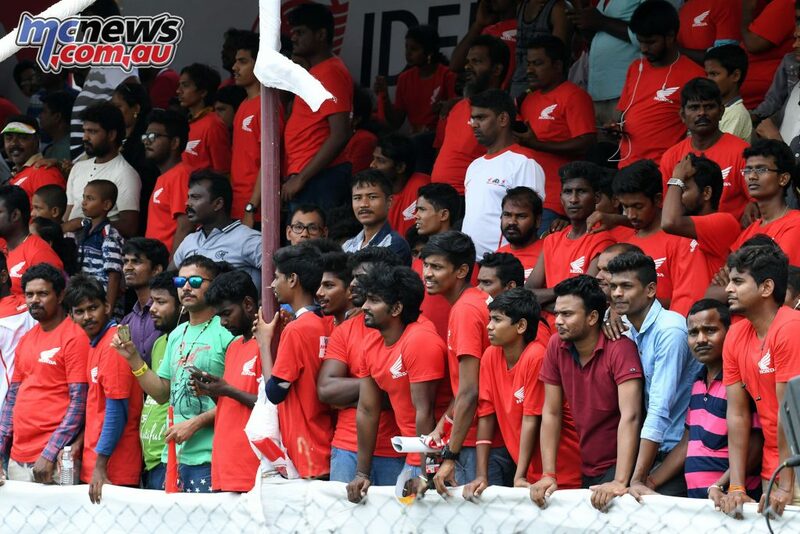 Because of missing the Indian round in 2017, it was Queenslander West’s first trip to the 34-year-old track which, despite its flowing curves, is made difficult because of a bumpy surface which he got to grips with quickly. Kicking off the weekend, West lapped within a few tenths of Musashi Boon Siew Honda’s two-times champion, Zaqwan Zaidi in Friday’s first two free practice sessions, before pushing the Malaysian rider off the top of the timing screens with a 1’41.388 in the third session. Title rivals, Azlan Shah and Yuki Ito were more than half a second off the pace and languishing in the middle of the pack. In Qualifying on Saturday morning the Musashi duo of Tomoyoshi Koyama and Zaqwan pushed hard, with the Japanese rider looking likely to take pole position after a quiet first half to the season. 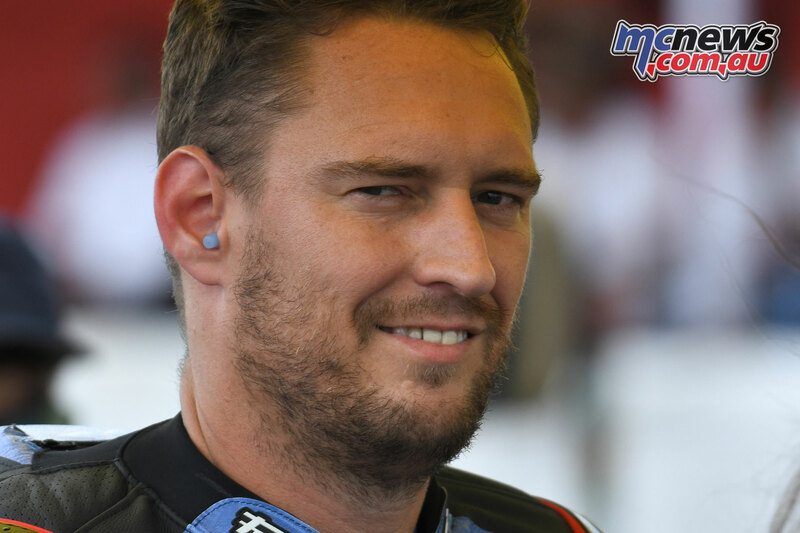 Then, in the closing minutes of the session, as Koyama watched from his pit box, West pulled the pin and set a new lap record of 1’40.585. 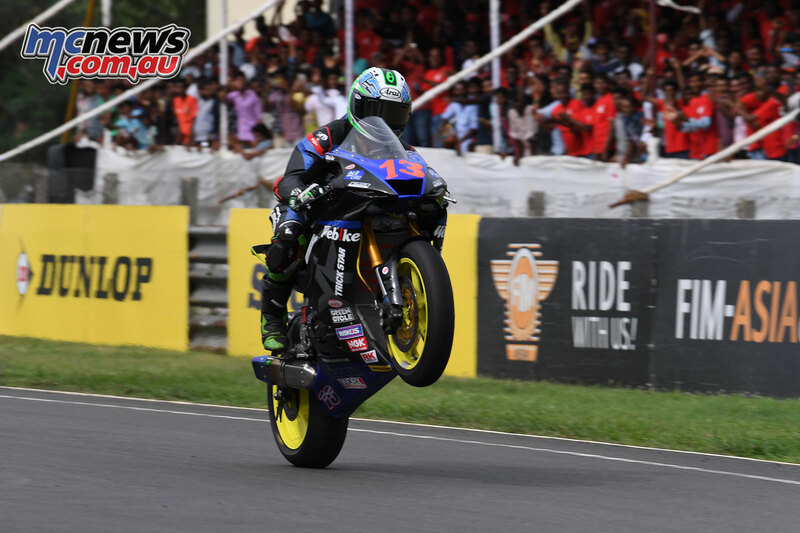 Zaqwan completed the front row, while Yamaha Thailand’s Decha Kraisart, Astra Honda’s Andi Farid Izdihar and Idemitsu Honda Team India’s Taiga Hada made up the second row. Azlan and Ito both qualified on the third row with times around a second slower than West. Come Race 1 start Taiga Hada shot through from the second row to lead the pack away, shadowed by Koyama, West and Zaqwan. During the first half of the 16 lap race, Hada fought off his rivals, despite all three taking brief turns in the lead. As tyre wear came increasingly into play, West made a decisive move into the lead and pushed hard. =Hada clung on, but was unable to get close enough to make a challenge and was caught by Zaqwan, Koyama and the impressive Indonesian 19-year-old, Andi Farid. 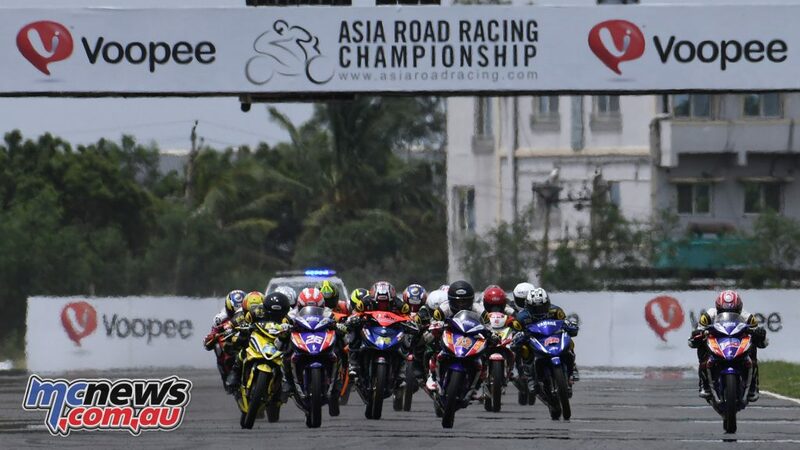 Just behind the leading group, championship rival Azlan skittled off Decha at Turn 3, while Ito found himself being beaten up by two Malaysian teenagers, Azroy Hakeen Anuar and Kasma Daniel Kasmayudin. 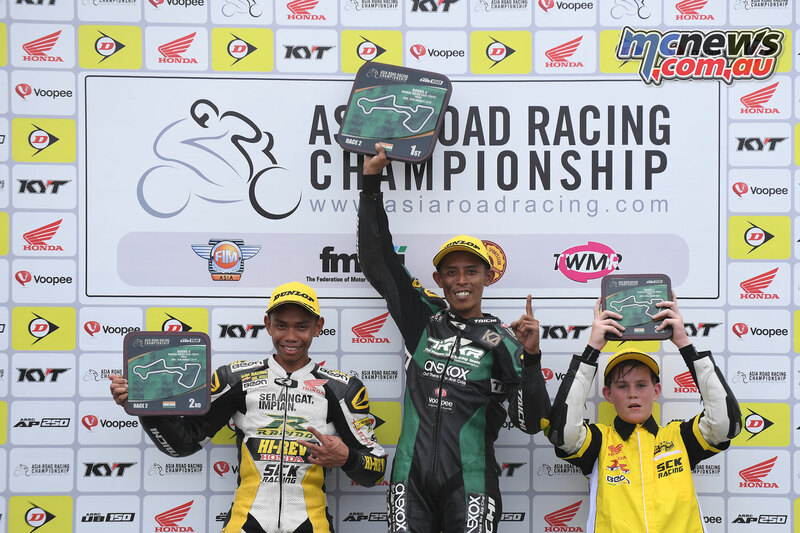 West remained in control to take the chequered flag three tenths ahead of Zaqwan, with Hada completing the podium, and Farid fourth, while Koyama was fifth. Azroy and Kasma succeeded in relegating Ito to eighth, helping extend West’s championship lead over the Japanese rider from 12 to 35 points. Sensing the double and the chance to get a firm grip on the 2018 title, West really put the hammer down in Race 2. After Koyama led briefly from the start, the Webike Ikazuchi rider got in front and put daylight between himself and his rivals by the time they crossed the finish line for the first time. Koyama, Zaqwan and Hada gave chase, after Farid crashed out on Lap 2, but their fight for second place only helped the Australian to get away and allowed Ito to catch up to the trio. As they came over the bridge and into the braking zone for the final turn, Ito made contact with Zaqwan, lost control and was ejected over the handlebars, leaving the finishing order as West, Koyama, Hada, Zaqwan, Azlan and Kasma. That leaves West with 136 points, now 51 clear of Azlan compared to the 12-point lead he started the weekend on, with Azlan taking just 11 points from Round 4, while Ito claimed only 8. Koyama lies fourth on 66, 10 behind Ito. 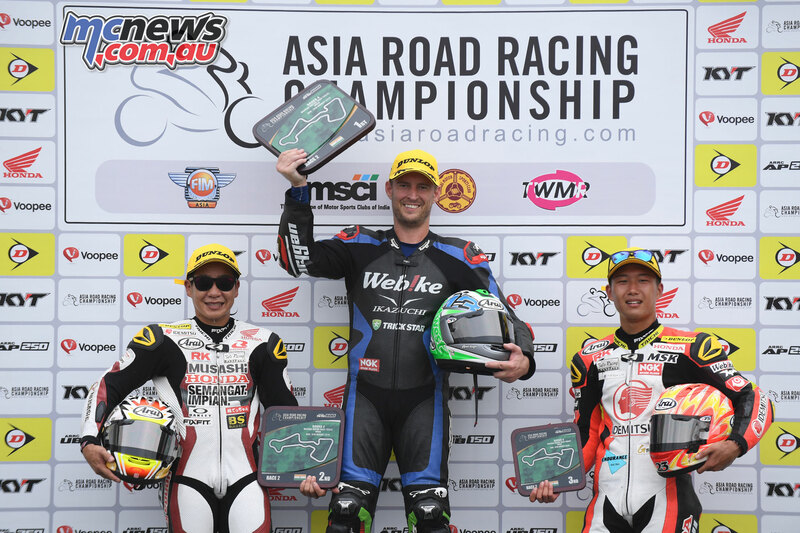 Travis Hall had his third outing in the cut-throat Underbone 150 class for Malaysia-based SCK Hi-Rev Honda over the weekend, continuing to prove himself. 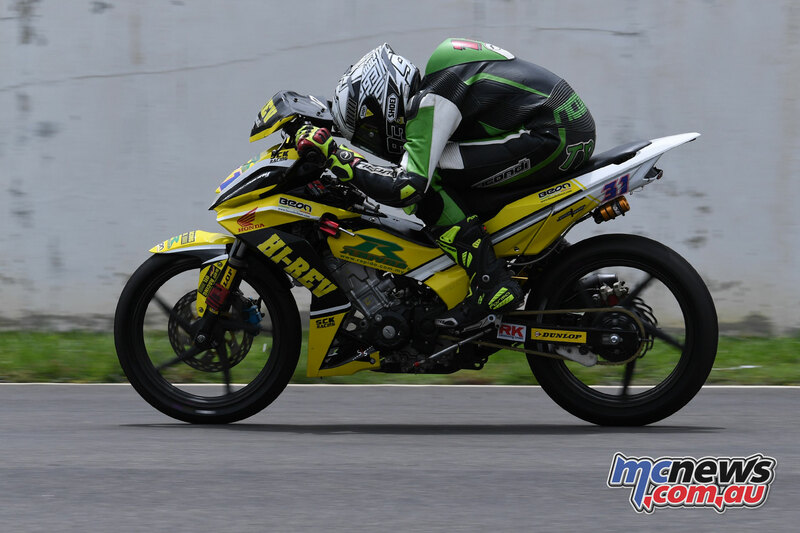 The 14-year-old has gelled well with the team, which has given him not only a bike of the same competitive spec as senior riders Helmi Azman and Fakhrusy Syakirin Rostam, but coached him progressively in race-craft to help him convert his pace into better finishing positions. 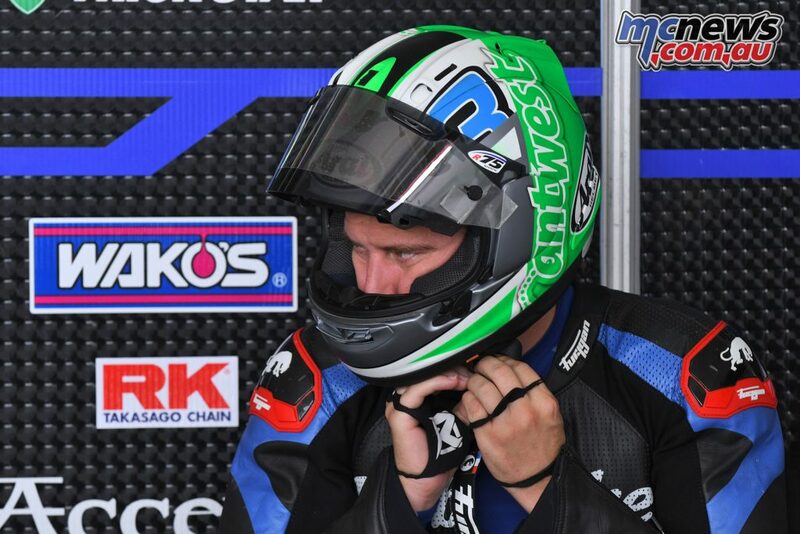 Travis went well throughout free practice and qualified 12th, which put him through to the Superpole shoot-out for the first 15 grid positions. 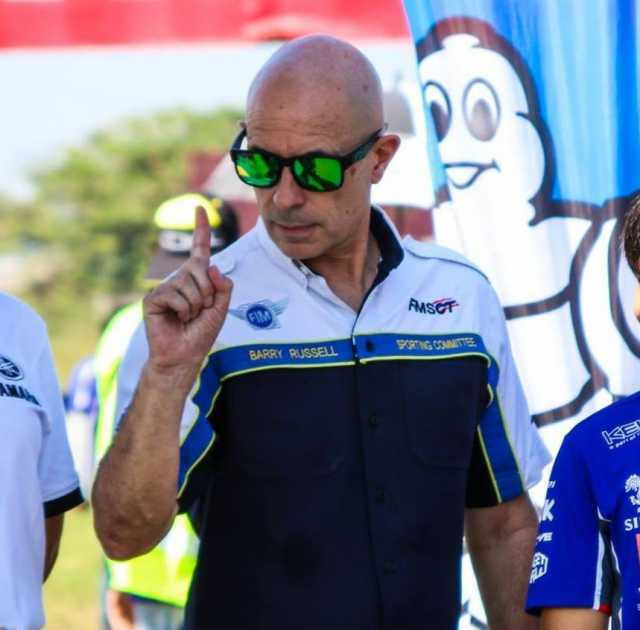 With riders going one at a time, the slipstreaming and tag teaming that goes on in other sessions is cancelled out and the youngster recorded the sixth fastest time to lift himself onto the second row, one place ahead of team-mate and championship leader, Helmi Azman. Remaining SCK rider, Fakhrusy, took pole position. Race 1 saw Travis stay within the leading group, getting more experience of the heat of Underbone battles, eventually finishing eighth, just four seconds back from the first three, Ahmad Fazli Sham, Helmi and Thailand’s Peerapong Luiboonpeng. In Sunday’s race Travis put together the lessons so far, circulating much higher up the order. 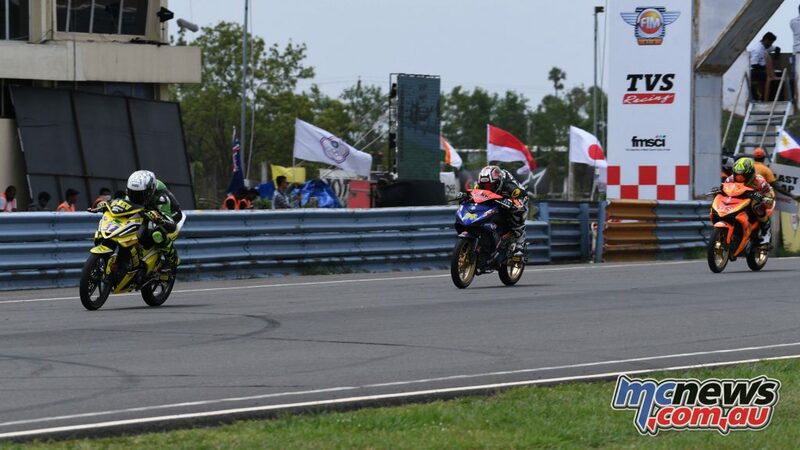 As Fazli and Helmi got clear at the front, all eyes were on the battle for third between the Australian, Peerapong and former champion, Affendi Rosley. Travis got ahead on the penultimate lap and looked very much up to the job of holding his position. 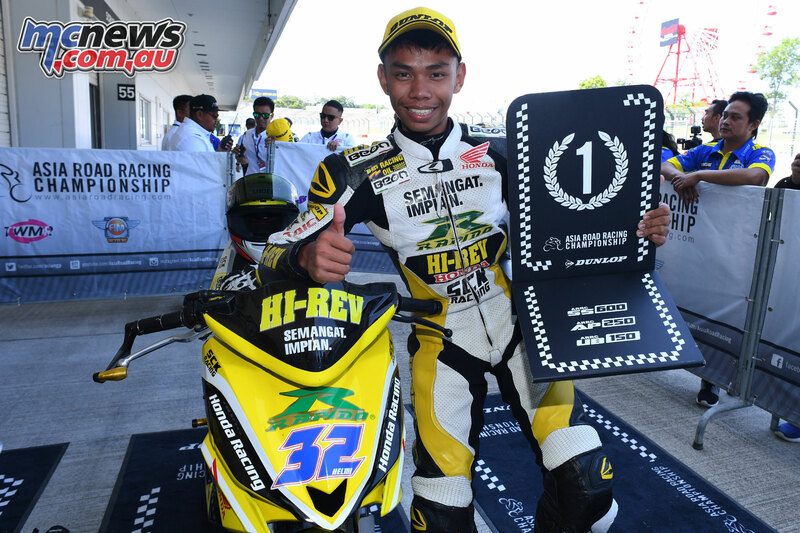 He stayed there into the final lap, until Peerapong and Affendi fell over each other, leaving him unchallenged to take third position and the first ever podium finish for an Australian in the class. Fazli completed his double, while Helmi took another second and opened up his lead in the standings. 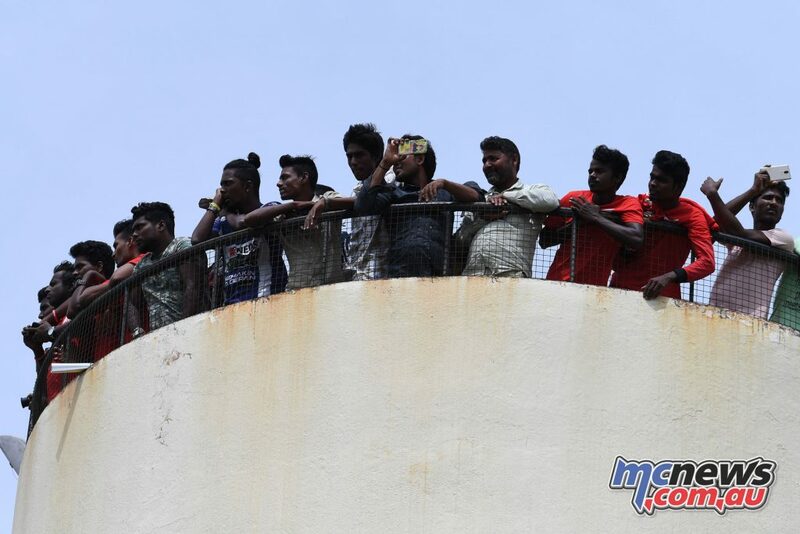 Spectators love a good story and the big crowd for the final day greeted his achievement noisily, while his mum struggled – and failed – to keep the waterworks under control. With no Australians in the Asia Production 250 class, championship leader, Rheza Danica Ahrens extended his advantage, winning Race 1 despite crashing out of Race 2, after his main rivals Mario Suryo Aji and Anuparb Sarmoon, also only managed one finish apiece. Rheza now has 144 points to Mario’s 122, while Anuparb, whose engine let go in Race 1 finished third in Race 2 to bring his total to 108.